Eyewitness 'heard man shouting' Jump to media player An eyewitness to a shooting in Birstall, which left Labour MP Jo Cox dead, says he saw a man holding a gun and shouting "Britain first or put Britain first". Remembering Jo Cox MP Jump to media player Tributes have been paid to Jo Cox MP from across Europe. Police announce MP's death Jump to media player West Yorkshire Police say they are not looking for anybody else in connection with a shooting and stabbing which left an MP dead. 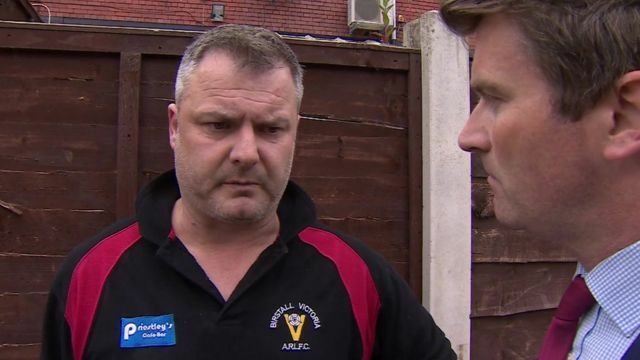 An eyewitness to a shooting in Birstall, which left Labour MP Jo Cox dead, says he saw a man holding a gun and shouting "Britain first or put Britain first". Clarke Rothwell told the BBC's Ed Thomas that he heard women screaming and a bang. Jo Cox, 41, Labour MP for Batley and Spen, was left bleeding on the ground after the attack in West Yorkshire. A 52-year-old man was arrested nearby. Go to next video: Jo Cox attack: What happened?